Anthony Vanderlinden is a noted FN collector and author of a book on FN Mauser rifle as well as this volume on FN’s Browning pistols. Both are excellent reference works, with a remarkable amount of contextual information in addition to the very specific detail that appeal to the collector. This work begins with about 70 pages on the history of the FN company, detailing its work in firearms, automobiles, and other products through the Great War, the Great Depression, World War Two, and other events. It then spends a period discussing unique and interesting FN pistols, like the presentation guns made for FN’s celebration of producing a million Browning pistols and the guns used by Gavrilo Princip and his cohorts in the assassination of the Archduke Franz Ferdinand. There are then sections on FN’s association with John Browning and on Browning himself, and on the markings and proofs used by FN throughout its history. 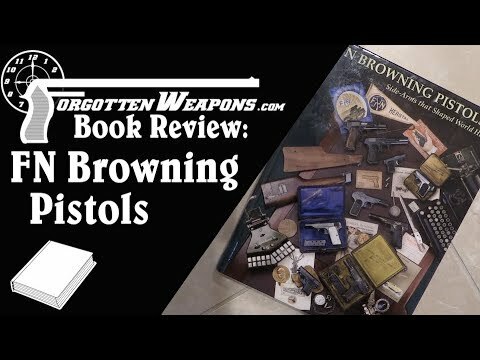 The remaining bulk of the book is broken up into chapters covering the development, production, and use of each model of Browning pistol produced by FN (namely the 1899/1900, 1903, 1905, 1910, 1922, Baby Browning, and High Power). These chapters do an excellent job of providing information on the early development of the guns as well as the commercial and military production, often broken down by the different contracts for each model. For instance, the 1922 chapter includes sections on Yugoslav, Dutch, Mexican, Greek, Turkish, French, Romanian, Danish, Finnish, and German procurement of those pistols. For the historian, the context presented does an excellent job of explaining each gun’s significance in larger events. For the collector, the attention to the details of differences in marking and production between each different variant is thorough and very useful. My only real complaint would be that the book is entirely in black and white. While that does not really hinder the purpose of the photographs in showing variations and such, color photographs would make it nicer to look at. The book was first printed in 1009, with a revised and expanded second edition printed in 2013. That second edition is available direct from Wet Dog Publications for $67.95 plus shipping, and also from Amazon.